Skinny & Houli are “Live at Lizzie’s!” every Friday night throughout the summer and this weekend’s show is hot! 103 degrees outside but nice and chill inside Lizzie McNeill’s Irish Pub as the lads welcome back cast members of Adam Whiteman’s hit show MUSIC MAD, (http://musicmad.net), which has been extended through July at Chief O’Neill’s. Kathy Cowan and Farley Masterton warble and fiddle respectively some Irish music on the show. Then Kathy O’Neill drops by from The Irish American Heritage Center to give us the line-up for next weekend’s Irish Fest, (irishfestchicago.com). 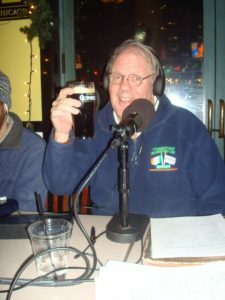 Next up in the hot seat at Lizzie’s is Chicago author Dennis Foley to talk about his terrific new book, “The Drunkard’s Son”, (sidestreetpressinc.com), a great Southside memoir. And then we’re joined by a couple of beautiful gals (see photos on our facebook page) 2012 St. Patrick’s Day Parade Queen Sara Collins and Loren Corry from her court. These gorgeous colleens will be at Sox Park in September for Halfway to St. Patrick’s Day game when Sara will throw out the first pitch! Sure it’s hot outside but there is nothing hotter than this week’s Skinny & Houli Show!